In 1965, Curt joined the Viscose Fire Company as a volunteer, following in the steps of his father and brothers and eventually became Chief of the Company. Curt was the first in the family to graduate from college. He received his Bachelor of Arts degree from West Chester University in 1969 with a focus in Russian studies. Following his degree, he went on to teach in the William Penn School District and serve as a member of the Board of Directors of the Chester-Wallingford Chapter of the American National Red Cross. Curt continued his education taking classes at Cheyney University and in 1973, Curt received an Associate’s Degree in Fire Science Technology from Delaware County Community College. He became a certified State and County level Fire Instructor and was appointed as the first Administrator of the Delaware County Fire Academy in December of 1974. 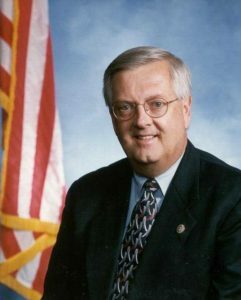 He served as a Republican member of the United States House of Representatives from 1987 to 2007, representing the 7th district of Pennsylvania.